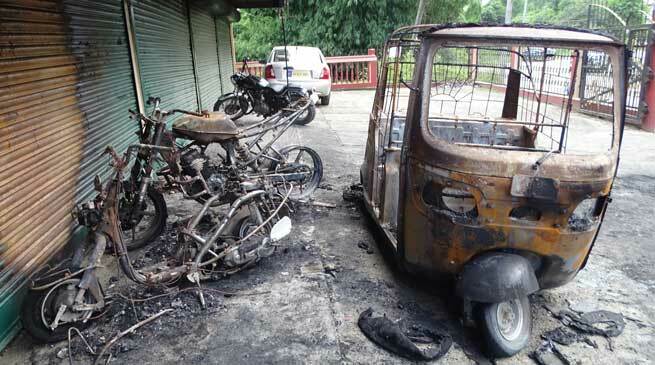 Miscreant burnt down three vehicle and partially two parked at the commercial building campus of Bharat Sonam at Papu Nallah at wee hours today. The three vehicle which include one Auto rickshaw bearing registration AR 02/4072, a Scooty bearing registration No AR 01 F /0717, Yamaha FZ motorcycle bearing registration No AR 01 F 9128 while partially damaging two Scooty bearing registration No AR 16/3017 and Honda Scotty bearing registration No AR 01 E 4336. Naharlagun Fire Service attended when alerted at around 2.08 AM and rushed to the spot at around 2.13 along with the Police and douse the fire to spread in the building, the RCC building also partially affected in the fire accident due to heat and flame Fire Station Officer PC Roy said. The Police sources said that it was the incident which occurred at the commercial building premises of Bharat Sonam at around 1.37 AM at Papu Nallah when the occupants were fast sleep. In the first instance which reveals from the CCTV footage seems that it is a case of attempt of theft of fuel and vehicle, but the burning of the vehicle at around 1.57 AM seems change the intension of the miscreant and other aspect cannot be rules out and investigation is on. The CCTV footage also reveals that there was only one miscreant. Meanwhile City SP Dr. A Koan said that a FIR have been received by Bharat Sonam by building owner and case have been registered wide case no- 103/17 u/s-435 IPC and investigation is on, he said that the CCTV footage is also investigated and cooperation from the victims and building owner is also requested. Meanwhile Bharat Sonam and a occupant of the building Mija Sonam thanks the security personnel working at Yupia Tinali who alerted them and by which they have been able to save themselves and their many motorcycle and four wheelers parked in the campus of other tenants.